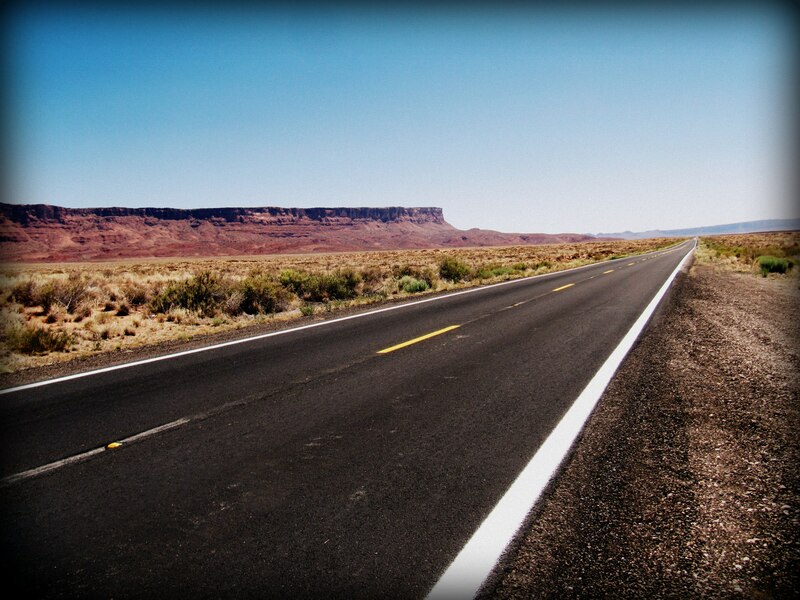 Rim to rim, the Grand Cayon is eight to ten miles wide as the crow flies. But as our car drives, it is a 200 mile route that takes 4.5 hours. That’s because you have to drive to the very beginning of the canyon, where it becomes narrow enough to create a simple bridge over it. But it is a beautiful drive. We were making our way at sunset which gave the landscape a golden glow. I couldn’t help but think that this what American road trips are all about. We eventually crossed the bridge and headed just a few miles north of it, to Lee’s Ferry. This is a historical site that marks the first ferry crossing in the area. 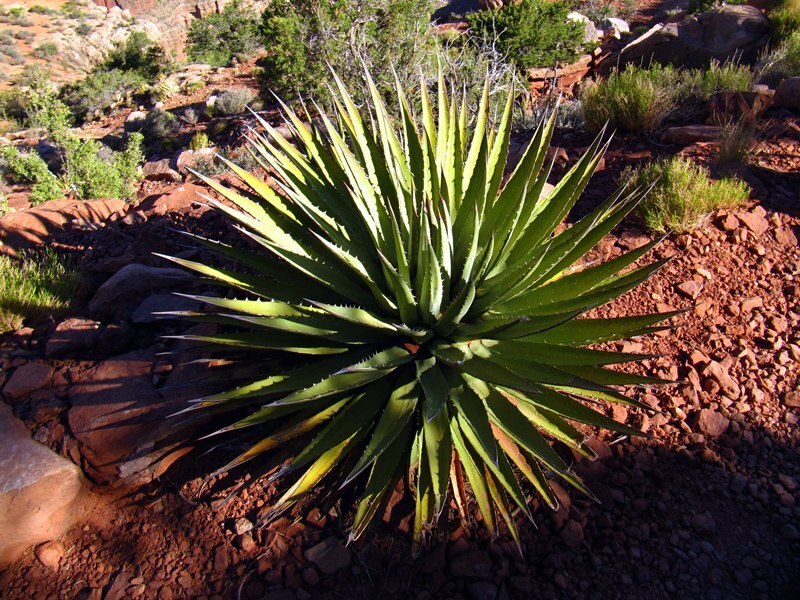 It was created in 1871 by a mormon family to help other mormons settle what is now Arizona. These days it is the launching point for the thousands of adventurous souls that raft down the canyon each summer. We took advantage of a small campground there to take refuge for the night. The next morning we explored the area where there are still some cabins built by the original settlers. They even have a small graveyard for all those that perished in the settlement or while crossing. 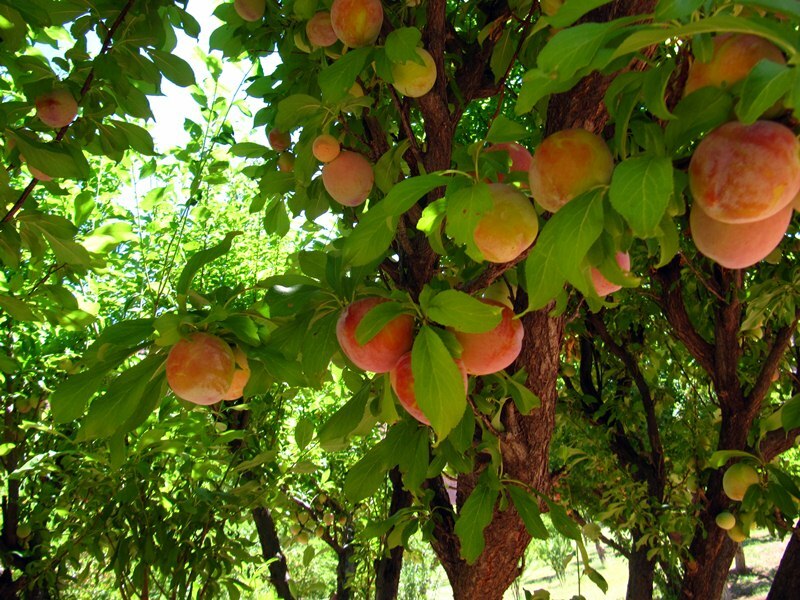 Another one of their legacies is a beautiful fruit orchard that stands out like an oasis in the red desert. 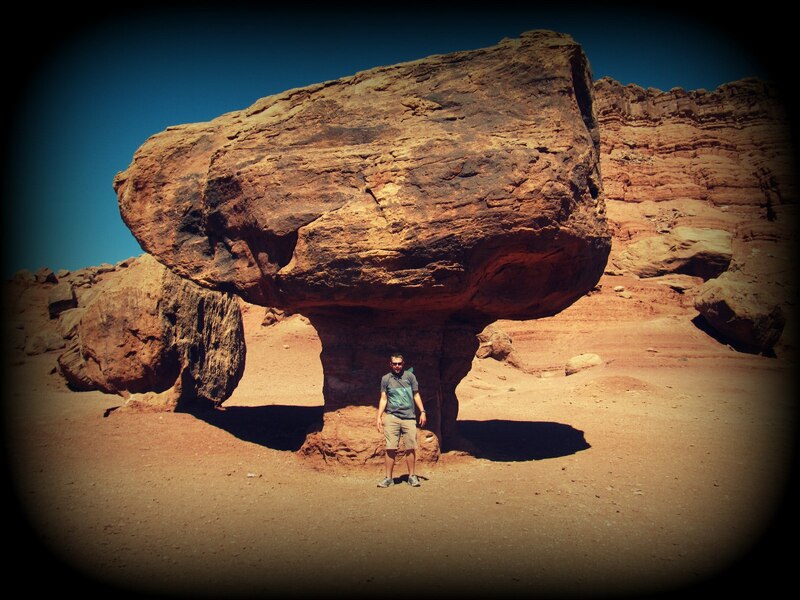 There are also these funky rock formations that are the result of a rock slide thousands of years ago. As the softer ground erodes away around the boulder, it forms a sort of tree shape. It was a reminder that this area of the southwest is truely a geologist’s dream. As we made our way to the north rim, the landscape changed dramatically. Tall pines and aspens took over the red dusty earth. There were grassy meadows and small ponds. The North Rim is actually closed October to May due to snow. It was amazing what 1500 feet in elevation could do. 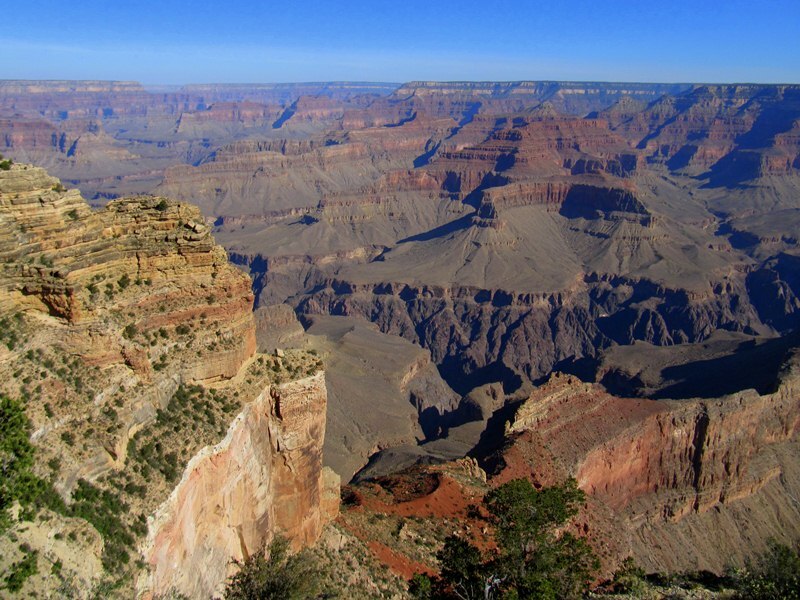 This limited access also meant that fewer people visited the North Rim, which made for a calmer, more tranquil visit. If I could only visit one side, I’d opt for the north. The aspens were particularly pretty. They were particularly prevalent because of a massive fire that swept through the area 20 years ago. 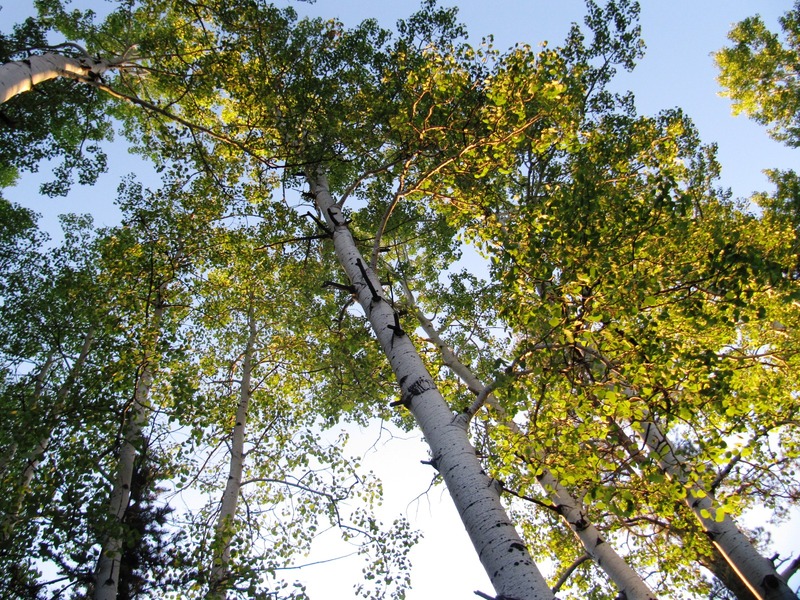 The aspens are the first to recover and provide shade so that the baby pines can grow. Eventually the pines will become taller than the aspens, which will die out from too much shade. After our arduous hikes on the south side of the Grand Canyon, I was ready to take it easy. But, of course, Nathan had other ideas. He was already ready for more hikes and backpacking. So we compromised with an overnight backpack trip that was 12 miles out and back to Tiyo Point. The hike did not dip into the canyon and instead remained on the rim. Therefore, it differed from inner canyon hike in three glorious ways: it was flat, shady and cool. On our last night in the canyon, we made our way to Cape Final. This was a special campsite, only 4 miles out and back. 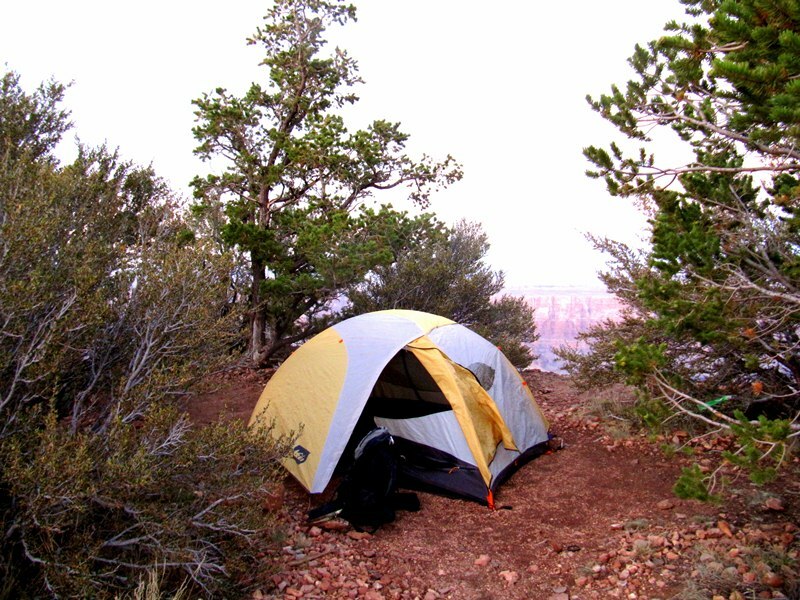 It’s a popular day hike but for an even better experience it has just one little campsite sitting on the rim. Our last morning we woke up with the sun and watched it rise over the canyon with no one else around. Spending a full week in the canyon was a wonderful opportunity, but it was time to move on north for more adventures. 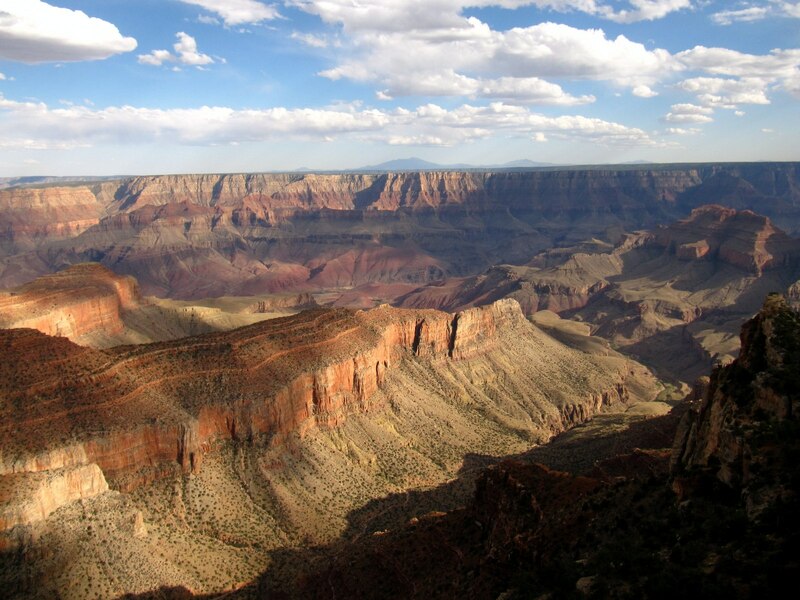 The best way to describe the South Rim of the Grand Canyon in summer is HOT. The heat that collects in the valley billows over the rim in waves of hot air. The dryness creates a landscape that is seemingly bleak and lifeless. 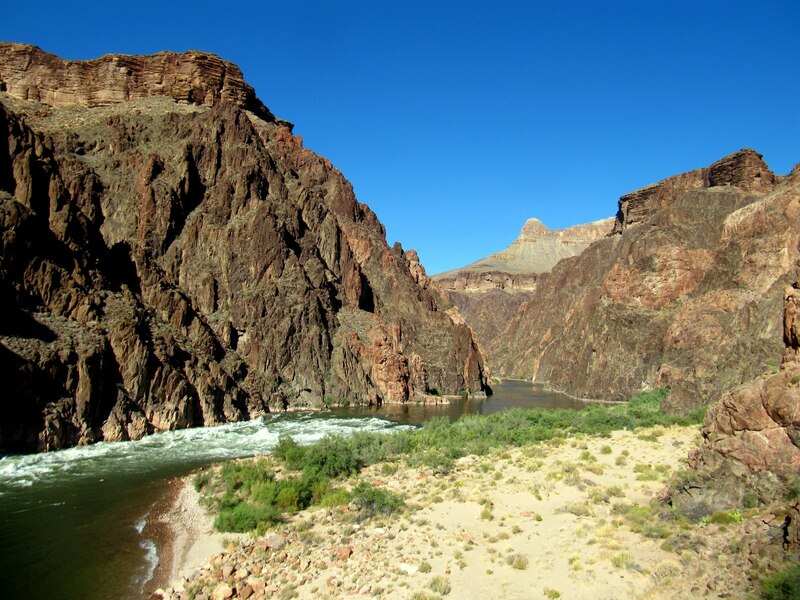 But then I when we peer down into the deep abyss, into the alternating colors of red, orange and white, we see the Colorado River. In total this artery to the region channels water for 1,500 miles acting as the lifeblood of a complex ecosystem. Thick pine forests meet the rims edge, and desert cacti cling to the valley sands. The waters were once colored red with silt, but are now blue and cold from dams upstream. We arrived just after dusk and pulled into a car camping spot just outside of the park. 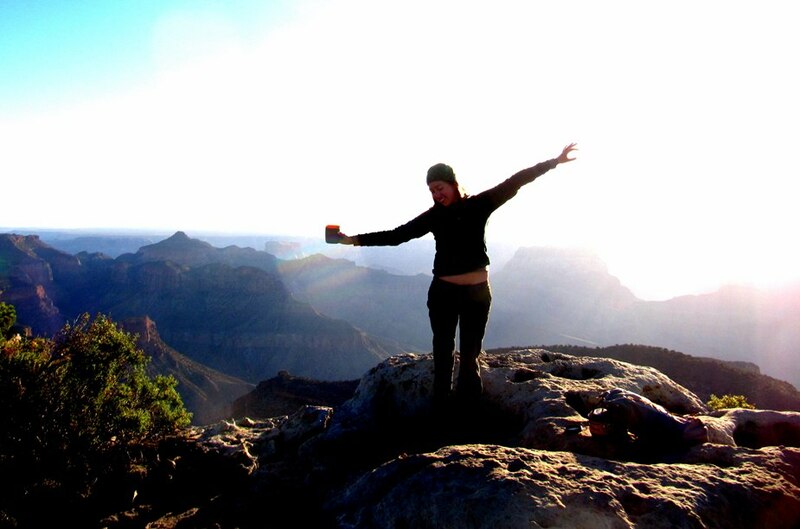 We woke at sunrise to go and see our first views of the canyon. We were immediately awestruck by the beauty of the canyon. The colors are bright and omnipresent; slowly the light brightens, our faces become visible and the glow fills the valley. We picked up our first set of permits at the back-country office and we were ready to begin our hike the following morning. 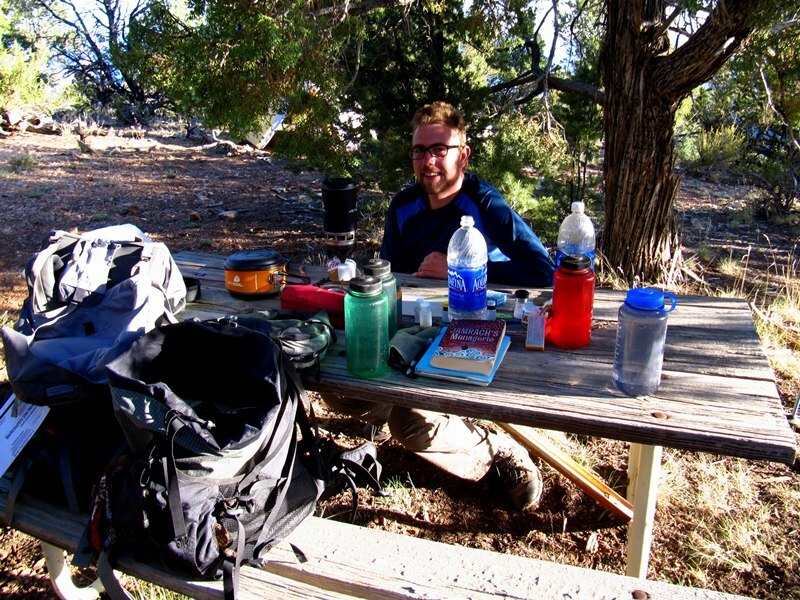 We had the afternoon free so we grabbed our water bottles and made our way to the South Kaibab trail. 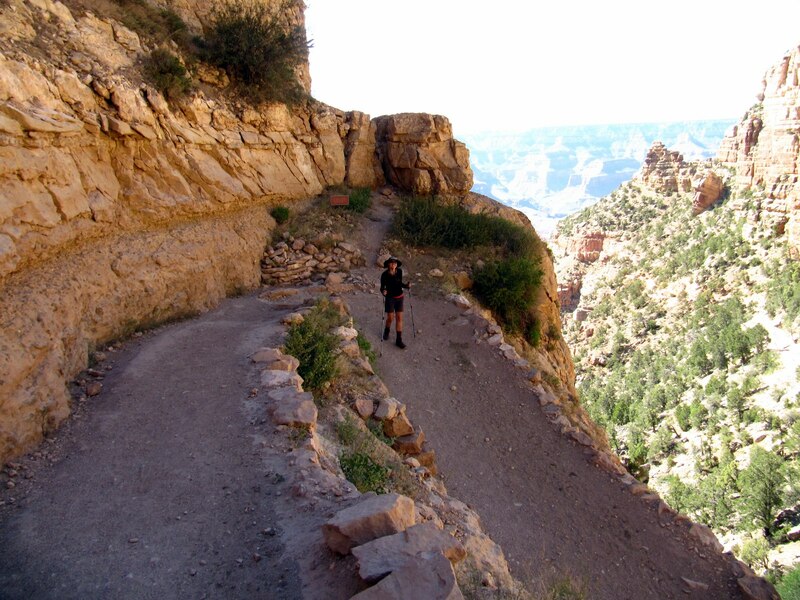 We traversed down the steep switchbacks and made our way deep into the canyon. This trail is exciting with steep cliffs on both sides and stunning views throughout its length. We walked along the ridge line soaking in the afternoon sun. 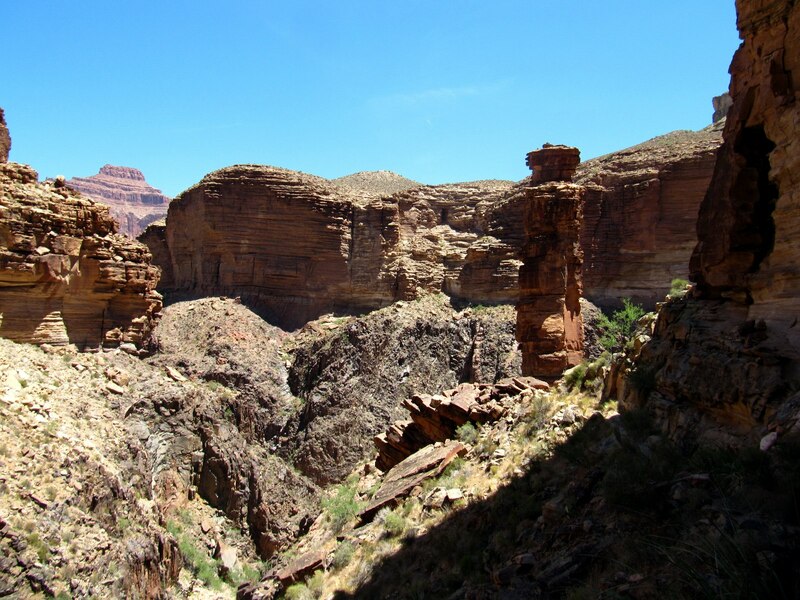 Our final stopping area and snack break was at Skeleton Point, a saddle at the tip of the ridge before the trail breaks off into more switchbacks to the Colorado River. Rejuvenated from a short rest, we turned around and ascended the 2,000ft (600m) back to the trail head. As we climbed our way back up the mountain the sun began to disappear beyond the cliffs. 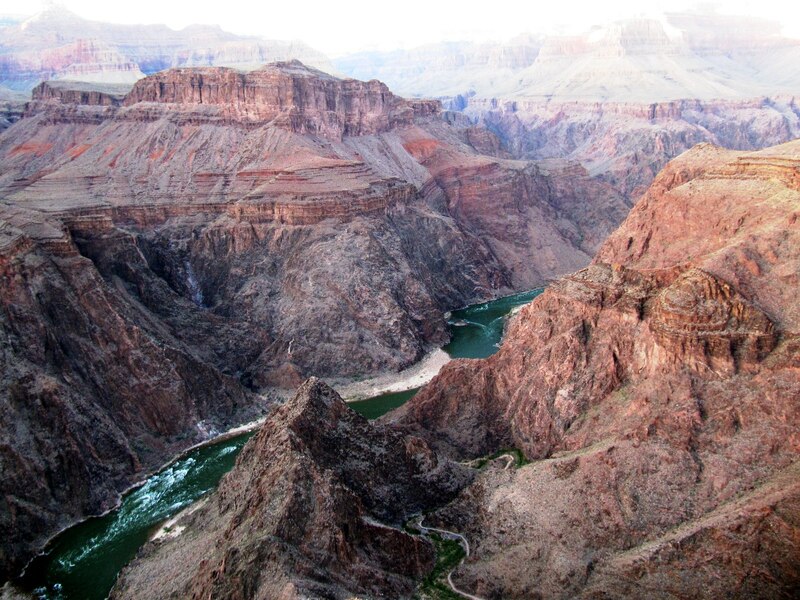 Slowly the grey shadows began to darken and the blackness crept its way up the canyon. 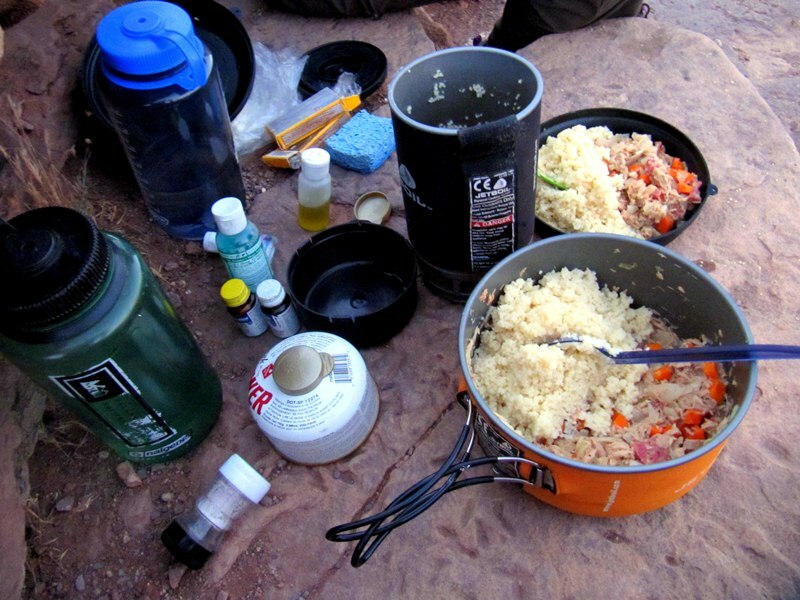 We setup our tent and cooked dinner that night in the darkness of the South Kaibab National Forest. The sunsets in the Grand Canyon are beautiful, but it is at sunrise that the park becomes a scene of magic and changing light. Our hike into the canyon began early at 5am. We hiked down the switchbacks in the usable twilight of dawn. 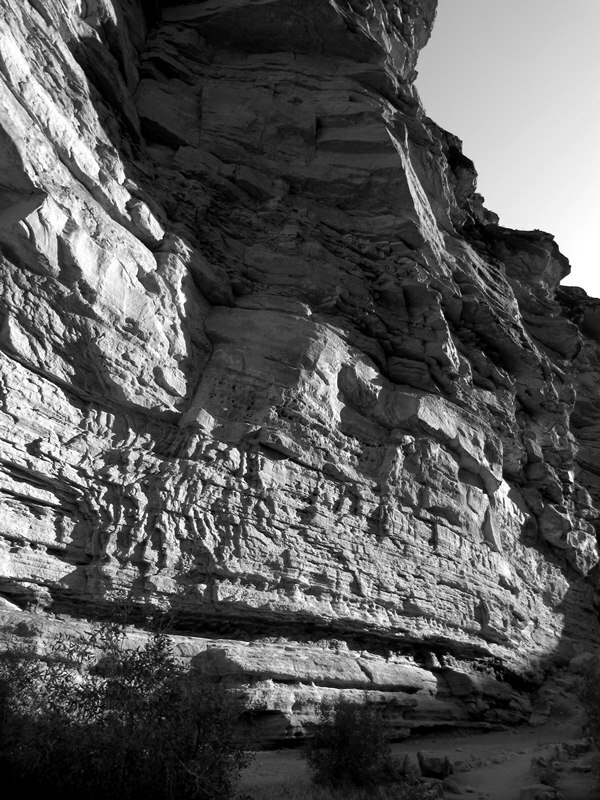 Slowly the canyon changed shape and color as the planar greys disappeared with a new day’s sun. 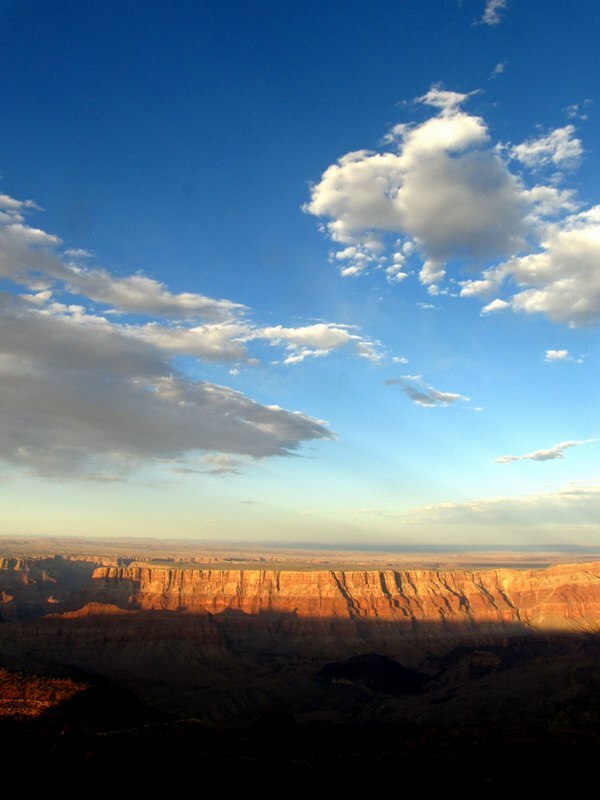 The sunlight first touches the upper limestone of the rim in every direction. Slowly this bright golden light drips down the cliffs illuminating the entire canyon. The shadows disappear, the heat engulfs us and we continue our walk in the full sun. The hike planned was a three day, two night, 30mi (48km) loop starting at Hermit’s Rest and returning from Indian Garden up the Bright Angle Trail. It was going to be very hot in the valley so we tried to get a jump on it. Water was also scarce so we carried one gallon each to safely get to our backcountry campsite with a natural spring. By 11am we had made it to the campsite at Monument Creek. No one else was there (because it was too hot) so we got the pick of the campground. Our camp overlooked intricate cliffs of vertical red rock. One column of rock, the “monument” of our camp, stood prominently 150ft (45m) in the air in the creek bed. We took a siesta in the shadows of the vertical rock. After 3pm the canyon began to cool down and it was safer to explore and hike around the area. 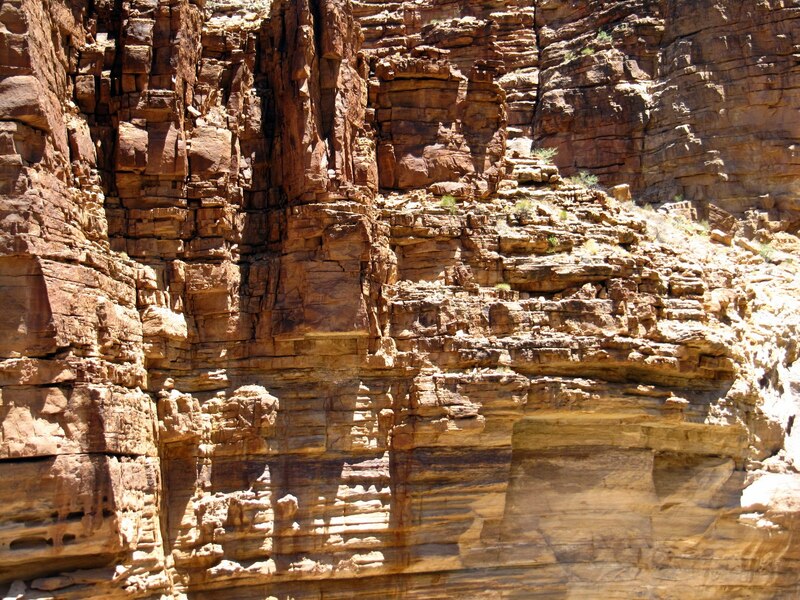 Our camp was on the Tonto formation which is an enormous ledge that wraps around the entire canyon. 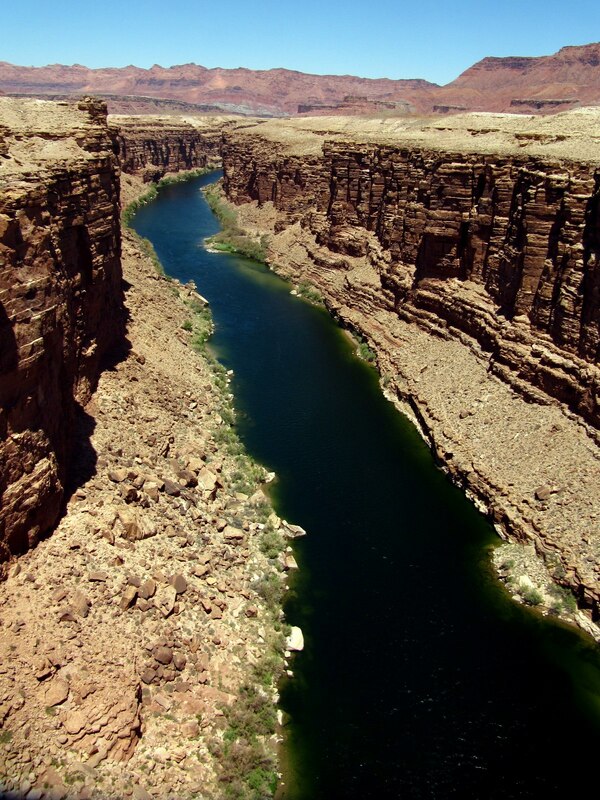 The Colorado river sits another 600ft below. We walked along the dried out Monument Creek until our voices were drowned out by the roaring Granite Rapids. A small hike upstream and the water was still and frigid enough to make me yelp when I plunged in head first. Refreshed, we made our way back into the depths of the canyon. Walking from the river out of the canyon is a powerful experience. The dark black gneiss at the water’s edge is two billion years old; the age of the earth is five billion. The history of the world was everywhere around us. We climbed over boulders and river rock to return to our camp, but we were also climbing back to the future. 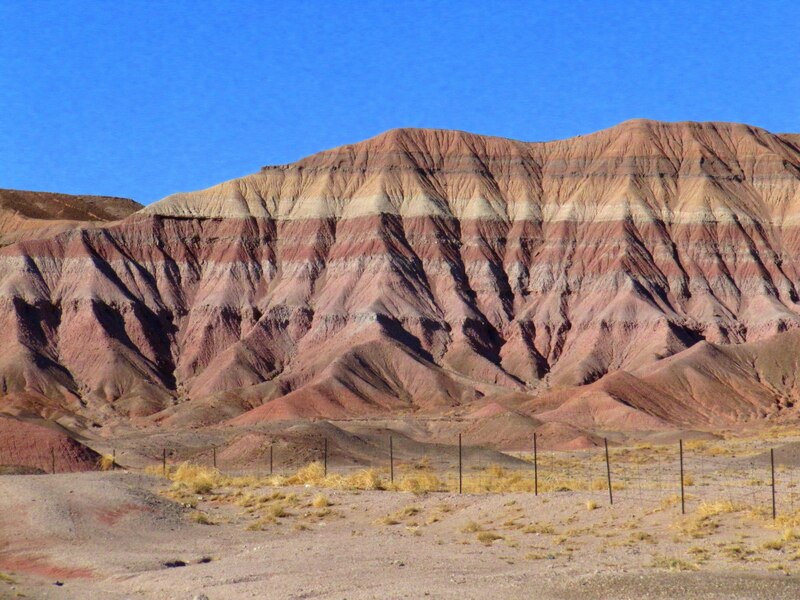 We walked from a time when volcanoes created the base of the canyon, and then alternating layers of sandstone and limestone as the landscape was created under large oceans hundreds of millions of years ago. Magnificent cliffs towered above us as we walked, but we remained careful of every step spending most of our time watching where we were going. 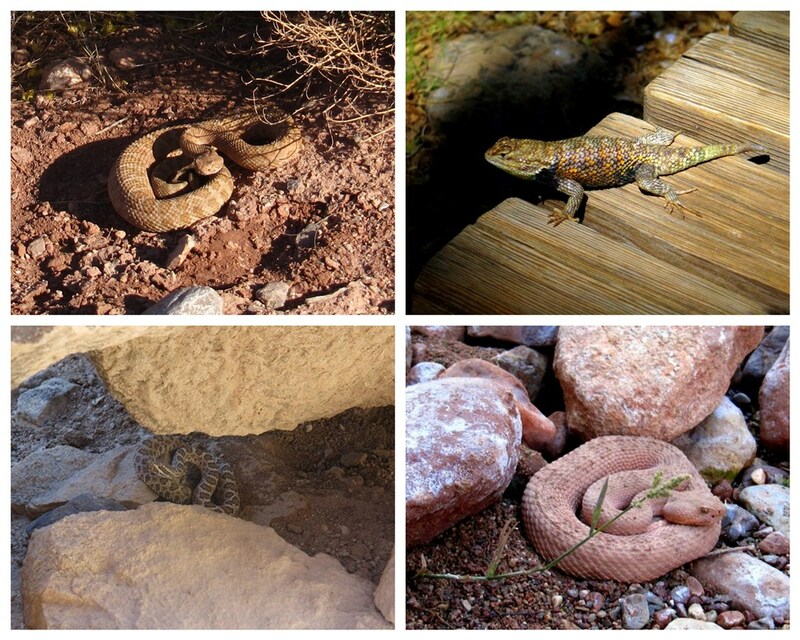 We encountered three rattle snakes in the first three days of visiting the Grand Canyon. In all cases the snakes were curled up in defense as they had heard us coming. To our benefit we walked with hiking poles that led us along the trails and river banks. With each discovery of a snake, it was fascinating how the colors varied and each was so remarkably camouflaged into its surroundings. A rainbow colored lizard insisted on hanging around our camp, he was plump and bold. He’d stare at us, and, when he knew we were watching he’d start a series of pushups then move a few inches and begin another set of pushups. Our second day of hiking was brutal. The hike itself was mostly flat as we traversed along the Tanto Trail that followed the steady, but exposed rock formation. The challenge was that by 6am we were already walking in the sun, temperatures quickly reached 100 degrees and we had six more miles to go. One step at a time we slowly and carefully made it to Indian Garden. 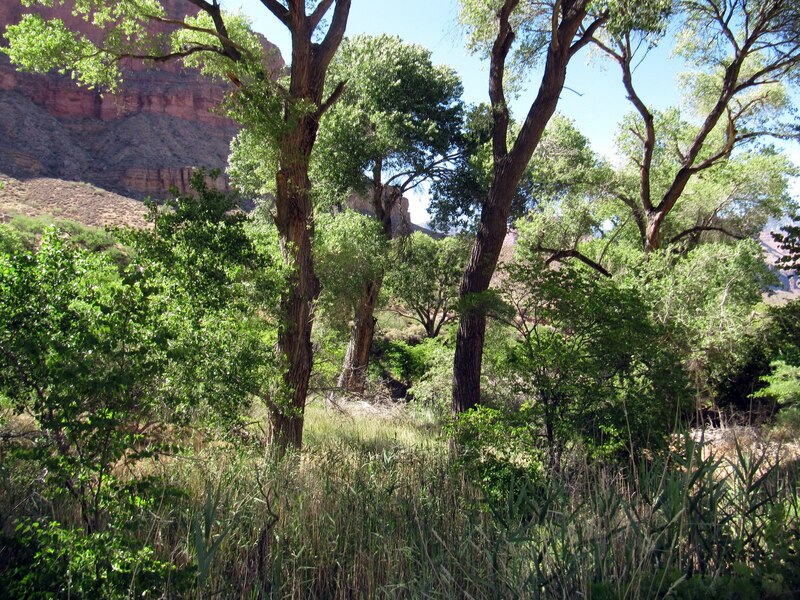 This lush valley had been used for thousands of years for seasonal agriculture by the Havasupai tribes. Today it is filled with non-native cottonwood trees, water-filling stations and many back-country campsites. 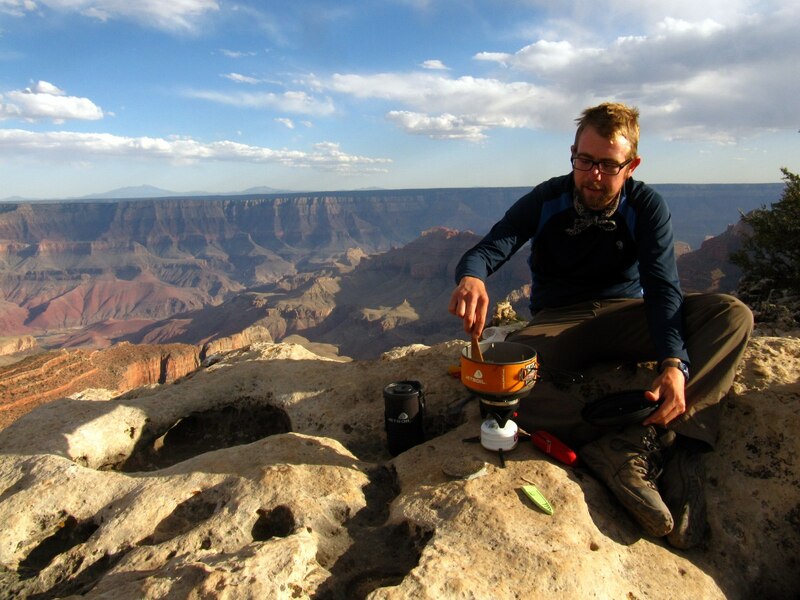 For dinner that night we decided to hike out onto the plateau point about a mile and a half from camp. From there we watched the sunset, and cooked up one of our standard back camping meals of sautéed tuna, onions, carrots and garlic over couscous with lemon. We could see the Colorado River from our little perch and quickly the sun faded away leaving us to walk in the dark back to our tarp. Ideally when we backpack, Carmen and I carry a tent. 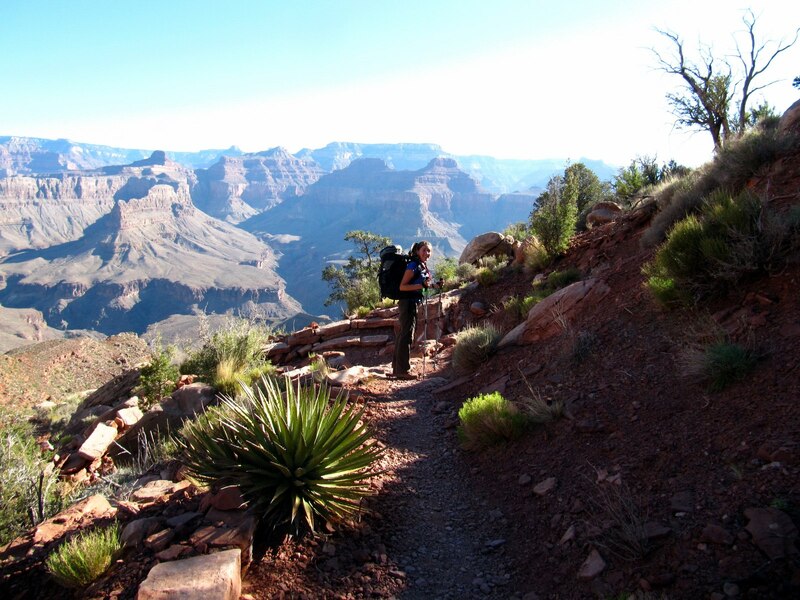 The lower elevations of the Grand Canyon were so hot that we left behind the extra weight and instead slept with only our silk sleeping sacks and the footprint of our tent. In the end it was well worth the 5lb savings, when we were also carrying 8lbs of water. 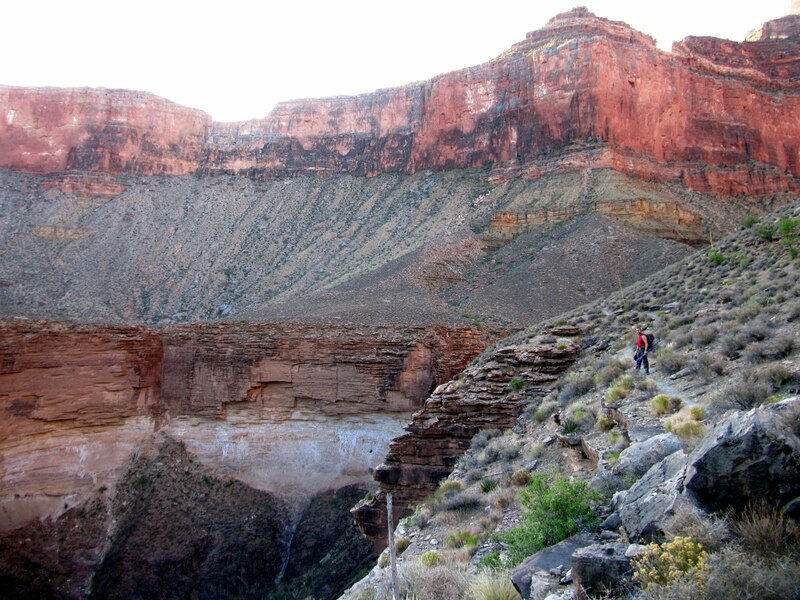 That next morning we awoke again in the darkness to set out on our ascent out of the canyon. 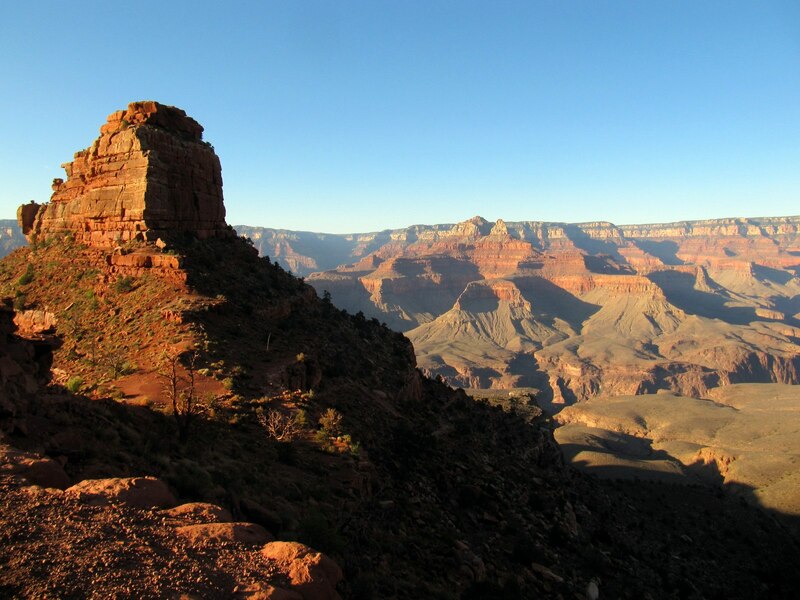 By 8am we had climbed 3,500ft (1,050m) and we sat at the Bright Angel trail head, catching our breath, finishing off our morning snacks, and gazing out into the morning sun lit canyon. 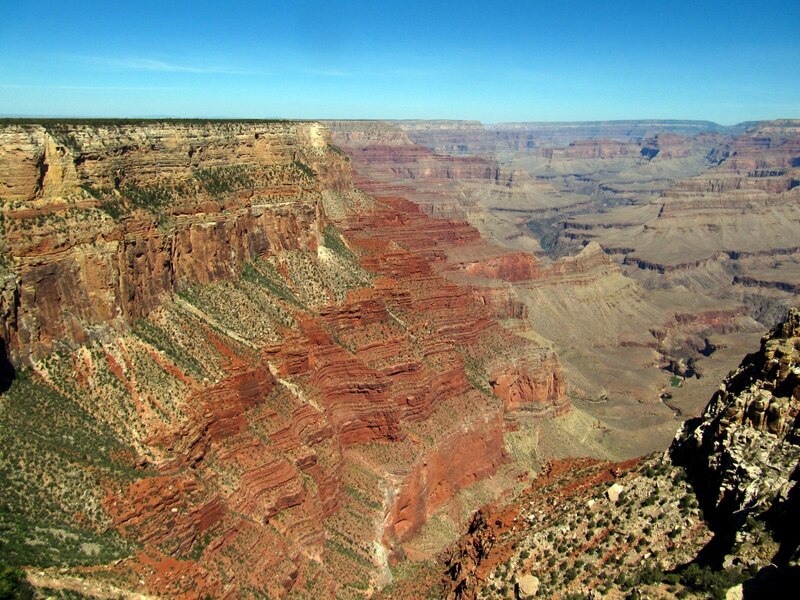 Indigenous tribes lived throughout the Grand Canyon for millennia. Evidence of their presence is well hidden, but everywhere. Only 5% of the national park has been surveyed and over 4,500 archeological sites have been discovered. 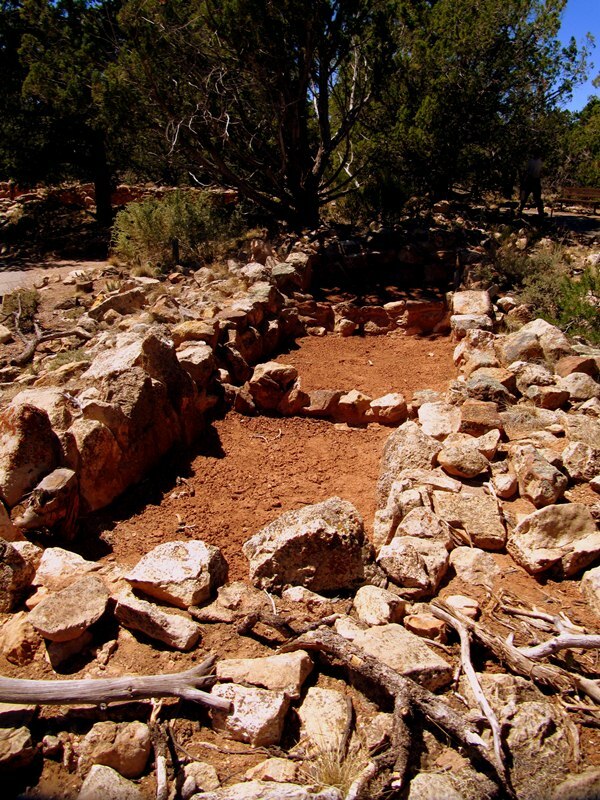 It is estimated that there are over 50,000 sites in the park that contain, rock paintings, building ruins, burial sites and agricultural plots. Only the most elementary of this archeology is shown to tourists, but it is possible to bushwhack through the forest and come across, a circle of stones that once built a village, or hand painted pottery that is centuries old. Archeologists have found parrot bones in these areas, which proves that the Indians here traveled and traded with tribes in Central America. 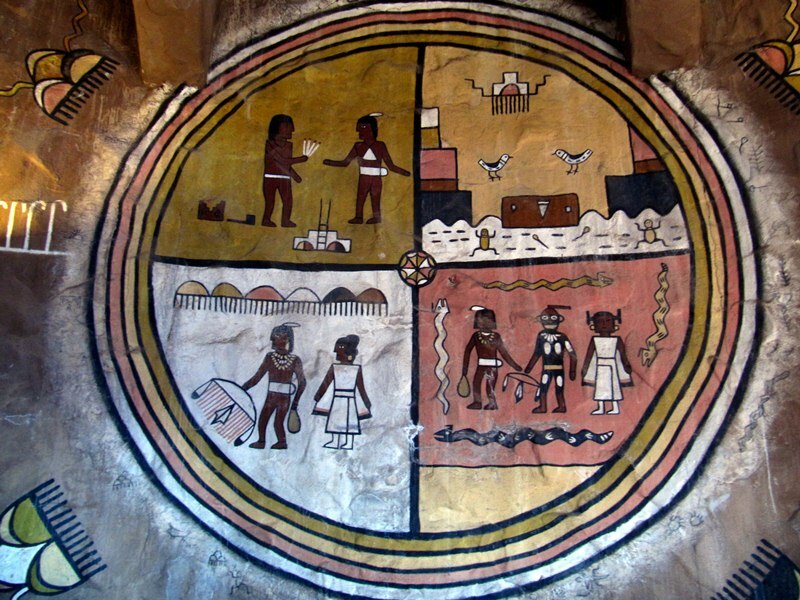 In the watchtower that was built on the eastern edge of the park there are some beautiful re-creations of Hopi Indian paintings. 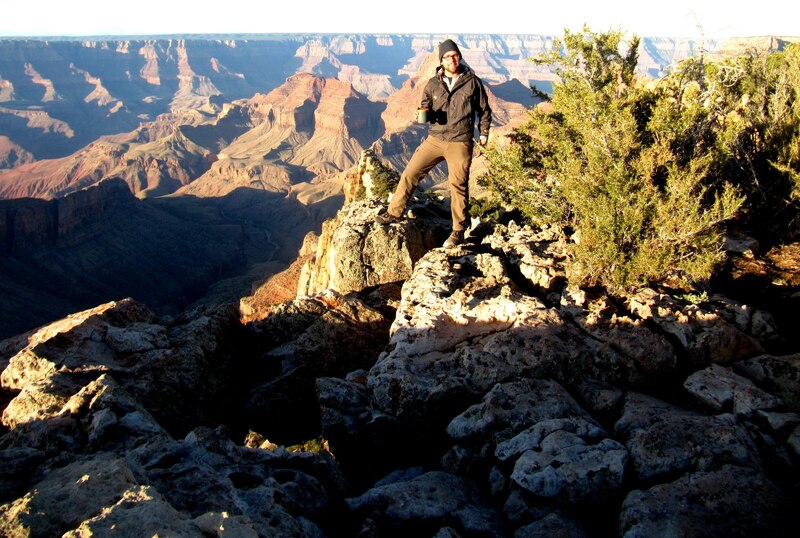 Our first four days in the Grand Canyon took us to phenomenal vistas, dizzying temperatures and eye-opening history. 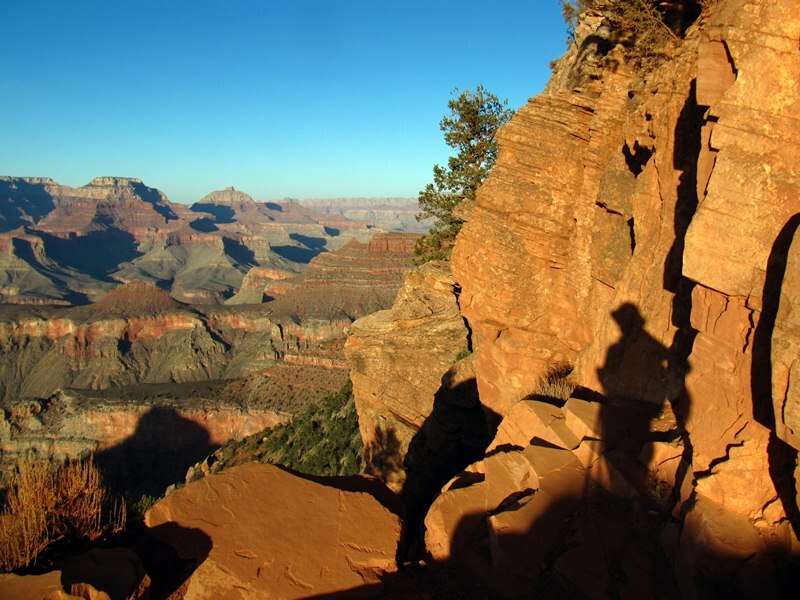 The south rim is the most popular place to visit for tourists, many of the best lookouts are accessible only a few steps from the public tram. A ten minute walk along any trail and the canyon begins to engulf and encapsulate with spectacular colors and unimaginable verticality. We would hike for hours without seeing anyone and each shadow and niche, each boulder and ledge was only for us to see that day. Very quickly I felt alone, not in loneliness, but more so as an explorer seeing a magical place for the first time. During our hikes we descended into the depths of the canyon, touched the water, traversed the cliffs and climbed back out. 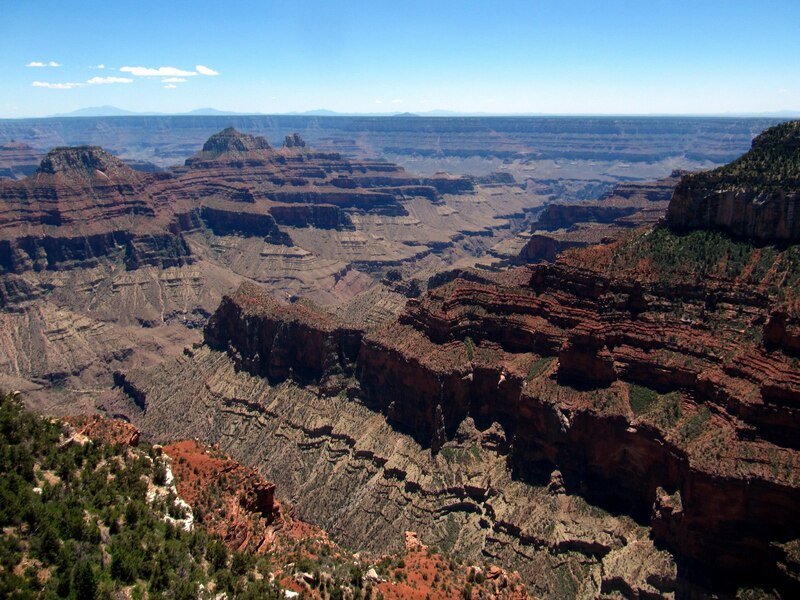 We descended into a prehistoric era and climbed back into the present to realize that the Grand Canyon has been one of the most beautiful places on earth for the last five million years.